Our Comfort & Care diaper assistance program has helped thousands of North American families who don’t have enough diapers for their children, whether because of a catastrophic weather event or a lack of financial resources. In addition, our Personal Care plants in Aneby, Sweden, and Toledo, Spain, give away adult incontinence products that are obsolete, overstocked or have small flaws. These Domtar diaper donations help make a difference in the lives of people in need. Fredrik Gustavsson, an environmental specialist at Domtar, oversees the diaper donation program at our Aneby plant. The plant has partnered with Human Bridge, a non-profit Swedish organization that collects and distributes medical supplies for development, relief and social projects. In 2017, Aneby donated more than 3,600 cases of Attends® adult incontinence products, including protective underwear, briefs, bladder control pads and bed pads. One note from Human Bridge described how Attends pads were given to women attending university in Ethiopia. Although tuition, food and housing are paid for by the Ethiopian government, many of these women have no additional income. They often turn to prostitution to pay for hygiene items or study materials. Having access to basic supplies helps them stay safe. Human Bridge also has a well-developed network in Ukraine, where Attends supplies go to hospitals and orphanages, and to low-income families, including those still suffering from the aftermath of the Chernobyl disaster. In addition, Human Bridge has delivered Domtar diaper donations to recipients in Moldova, Romania, Tanzania, Somalia and Iraq. In one case, products were given to a pediatric hospital that’s short on beds and supplies, and where more than 80 percent of the patients are refugees. Domtar’s facility in Toledo, Spain, has a long history in the community. Our Indas brand is a market leader in the Iberian region. Susana Blanco, who works in communications at our European headquarters in Madrid, collaborates with colleagues from the export, legal and finance departments to manage the Domtar diaper donations program. “We work with several charities, giving us as broad a reach as possible,” she says. One such charity is Mensajeros de La Paz (Messengers of Peace), which was founded in 1962 to house orphans. Today, the charity has broad humanitarian goals and is present in more than 50 countries. 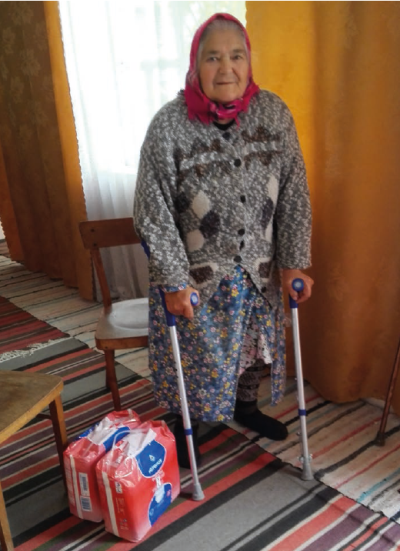 An important aspect of the charity’s work is improving quality of life for the elderly. Appropriate absorbent hygiene products can help seniors enjoy greater independence and can help improve sleep. Madrid-based Fundación Madrina focuses exclusively on helping struggling single mothers. Domtar diaper donations provide a number of hygiene products to this group, including bladder control pads and baby diapers. We have also established a partnership with Acompartir, a Spanish nonprofit organization that belongs to the European Goods to Give alliance. In 2017, Indas received the Acompartir stamp of approval in recognition of our Domtar diaper donations. 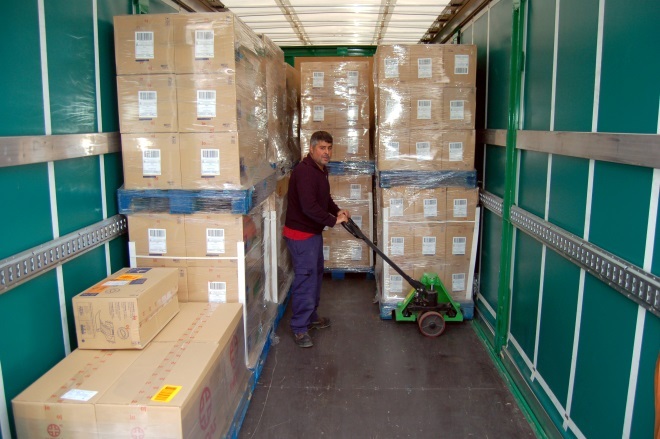 Indas products are loaded for donation to Acompartir.